He gave us to understand very early, that it made very little difference to him, how others were situated so he was comfortable. This trait was displayed on board the boat coming down the river where he ordered the men out of the cabin, and made officers pay for their rooms, and for our nurses, for which favor I was told he received a good stateroom and his meals gratuitously. He has a habit of shifting all blame that belongs to him on somebody else. He did not behave with gallantry at Vicksburg. It is notorious that our regiment has always had to make the tail of everything. When other regiments had plenty to eat, and to wear, ours was minus. He has shown himself an incompetent officer, has brought our regiment into disrepute, so that if I say I am a member of the 35th Iowa, to any soldier or Iowa citizen he at once feels prejudice against me. This is a brief history of our present colonel. I am sorry to say that if he were not colonel of our regiment and some military man would take command of it, that it would be a great deal better. 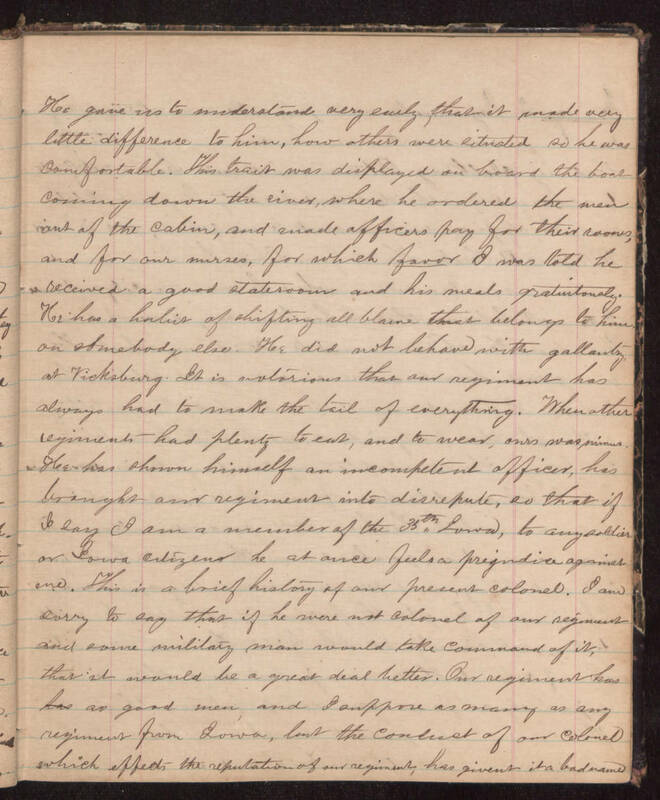 Our regiment has as good men and I suppose as many as any regiment from Iowa, but the conduct of our colonel which effects the reputation of our regiment, has given it a bad name.